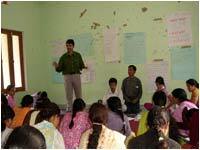 Vikalpdesign conducts trainings and workshops in the areas of Reproductive Health, Communication and Life Skills. Some examples are mentioned here. Under the "Fund for Leadership Development" of the MacArthur Foundation, year 2000-2003, Vikalpdesign was able to make significant contributions in the field of reproductive health communication. Effective training programmes and media material on sexuality were designed to address young rural people. 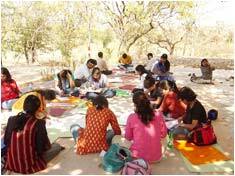 The fellowship project collaborated with 8 NGOs in Southern Rajasthan and worked with 600 adolescents. Through illustration workshops and training programmes we understood perceptions of young people and addressed sexuality issues in creative ways. Developing 4 Training Manuals corresponding to the 4 training phases. 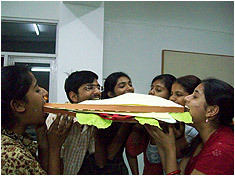 The training design included using all products within the ASHA JHOLA. The campaign was designed to increase utilization of the Mobile Van services in order to improve access to RCH services in areas with poor access. The strategy involved a combination of training and information dissemination. information dissemination for PNC, ANC, immunization, nutrition and menstruation through campaign material. A training was conducted for 120 ASHA workers on the method to manage the campaign and ways to make the campaign effective. The training component included a “dissemination time table” to facilitate easy distribution of the communication products. 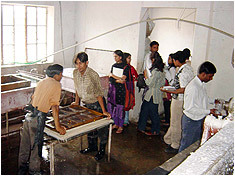 Vikalpdesign believes it is important to have creative people working in the area of rural development. To this end, we help design students to get oriented to rural issues. This way, young designers get a "world view" as it places creative communities in practical, meaningful contexts. consciously sharpen observation skills by learning to use the five senses.